This fabulous collection of dishes from exotic Indonesia and the sun-soaked Philippines is illustrated with 750 evocative photographs and is guaranteed to delight your tastebuds. This book features sensational dishes from an exotic cuisine, with 150 authentic recipes shown step by step in 750 beautiful photographs. It includes deliciously aromatic, spicy and occasionally fiery recipes, such as Hot and Sour Filipino Fish Soup, Indonesian Stir-Fried Noodles, Bali Fried Poussins, and tender and fragrant Slow-cooked Buffalo in Coconut Milk. It offers all you need to know about equipment, cooking techniques, and using ingredients – the perfect illustrated practical instruction course. Indonesia and the archipelago that forms the Philippines border each other, yet have nurtured distinct culinary traditions. Indonesian cuisine has a reliance on fragrant herbs and spices, while in the Philippines the Spanish influence is more evident. 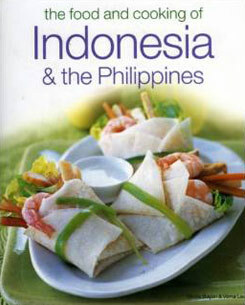 The many exciting recipes in this book include Sardines Cooked in Spicy Coconut Milk with Herbs, Colonial Rice Soup with Pork, Filipino Paella, and Adobo, as well as sweet drinks and desserts based on local fruits and coconuts. This fabulous collection of dishes from exotic Indonesia and the sun-soaked Philippines is illustrated with 750 evocative photographs and is guaranteed to delight your tastebuds.